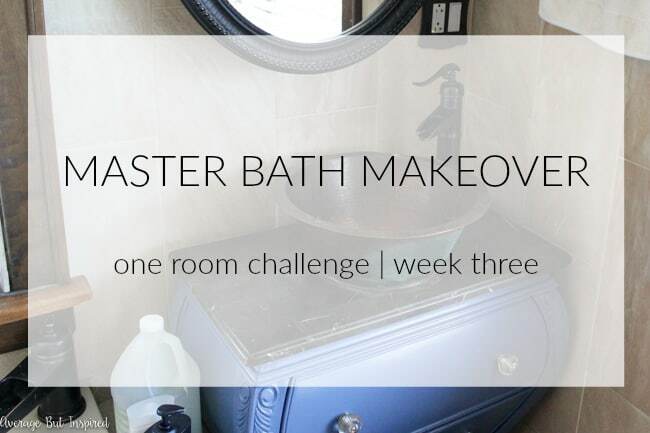 Six short weeks ago I set out to give my boring beige and neglected master bathroom a makeover as part of the One Room Challenge hosted by Calling It Home. It’s hard to believe that the day is finally here where I get to show you how all of my hard work came together! 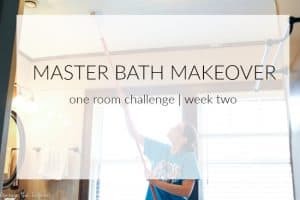 Before we jump into all of the “good stuff,” let’s take a quick stroll down memory lane and rehash how we got from a master bathroom that was practically falling apart to a light and bright space that my husband and I actually enjoy using now! 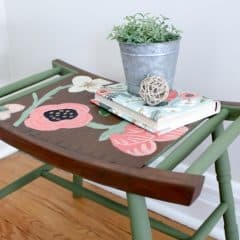 Week One: I shared the ugly truth about the most forgotten room in my house and showed you my plans for making it better. Week Two: I scraped the peeling ceiling and gave it a fresh coat of paint. Week Three: I took my dark and fussy vanity to bright and beautiful with special vanity paint and installed new light fixtures. Week Four: I primed and painted the beige walls and dark trim and instantly updated the room. Week Five: I hung new wall art, bought too many rugs, and filled you in on some shortcuts I was taking in the room. 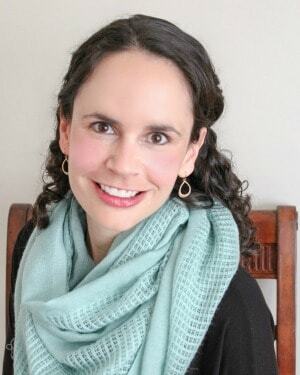 No wonder I have dark circles under my eyes; that was a lot to cram into six weeks! OK, I know you’re thinking “enough with the chit chat – show me the pictures.” So here we go! Of course, no good makeover post would be complete without some BEFORE photos, so I have to show you those first . . . just in case you forgot how truly awful my master bathroom was at the beginning of this challenge. 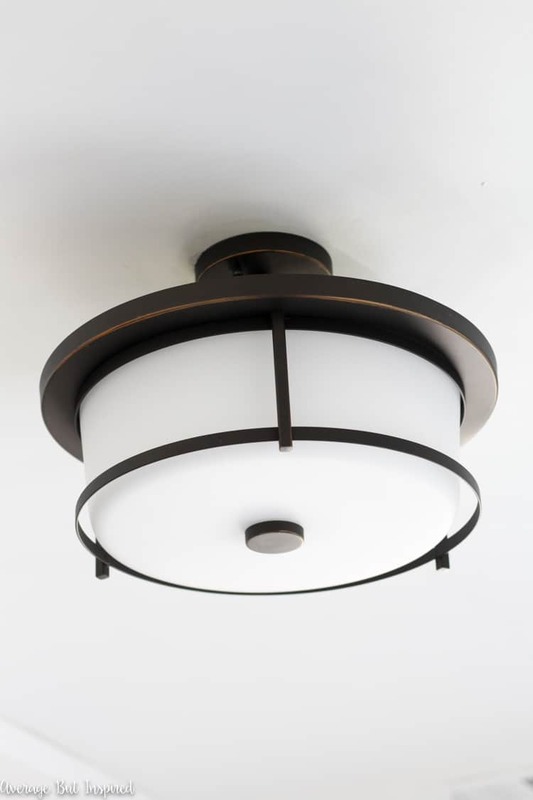 Dark trim, ugly vanity, dated light fixtures, too much beige . . . the list goes on and on. If you enjoy being tortured, you can see more of this train wreck in Week One’s post. This post contains affiliate links. To read my full disclosure policy, please click here. 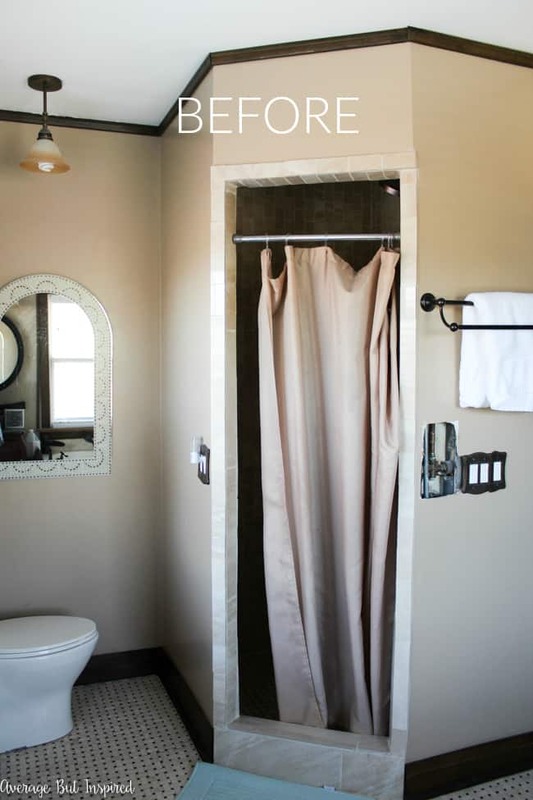 Also, thank you to DecoArt and Sherwin-Williams for providing product used in this bathroom makeover. Oh my gosh! I can’t wait to hear what you think about this! 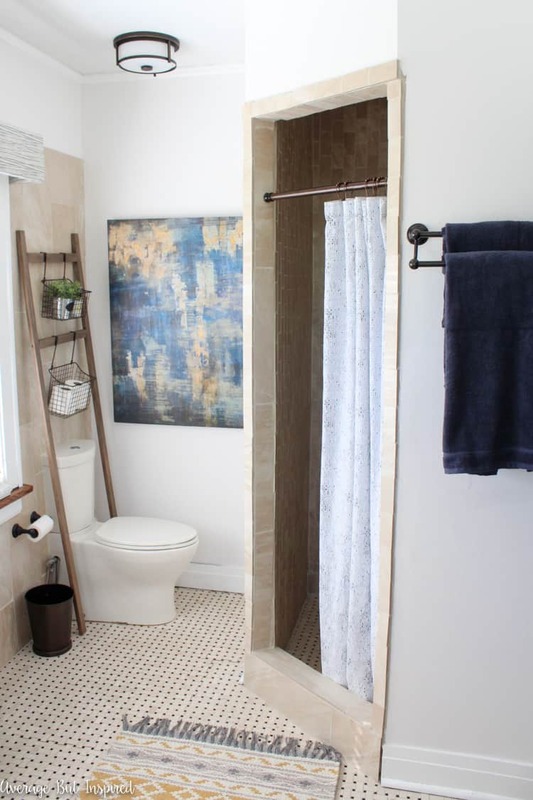 I really worked so hard on this bathroom and I feel like the changes I made with paint, fabric, and textiles have made such a shocking difference. 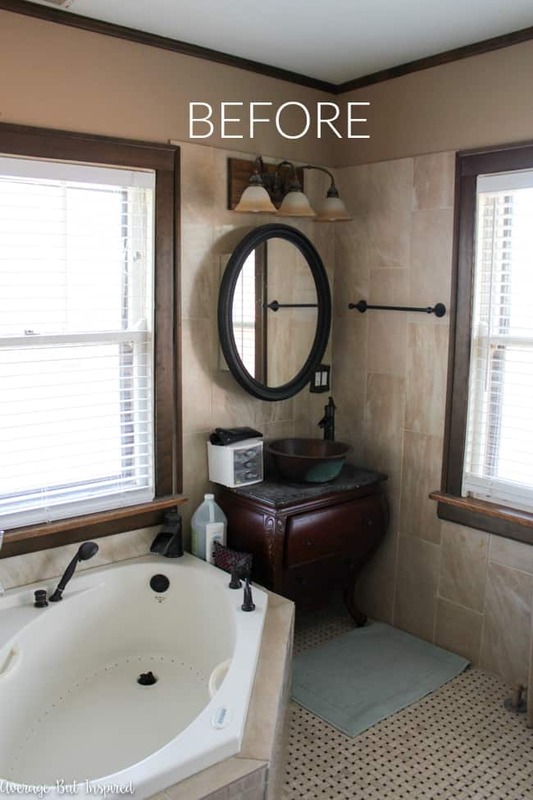 Painting the vanity made a huge impact and is one of my favorite parts of this bathroom. I really dislike this vanity and sink area (it’s too ornate for my style, it’s too small, and the huge vessel sink leaves us with no counter space whatsoever), but the gorgeous new color and hardware makes it much more tolerable! 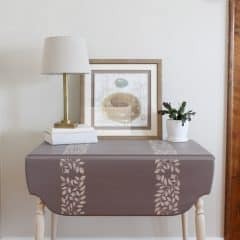 A new vanity light fixture, new hand towels with pretty tassels and detailing, DIY cornice boards over the windows, and the bright white window trim and wall paint (that resists mildew, I might add! ), also made this vanity area look so much nicer. 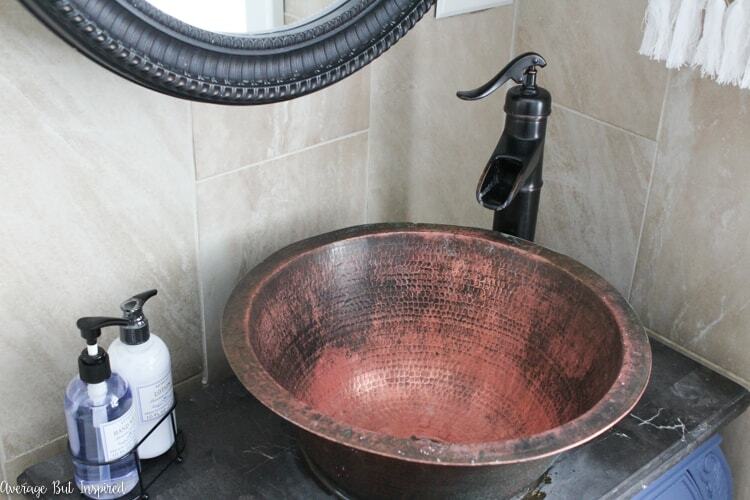 I even shined up the copper sink with a homemade mix of lemon juice and salt. It was crazy to watch it shine in no time! 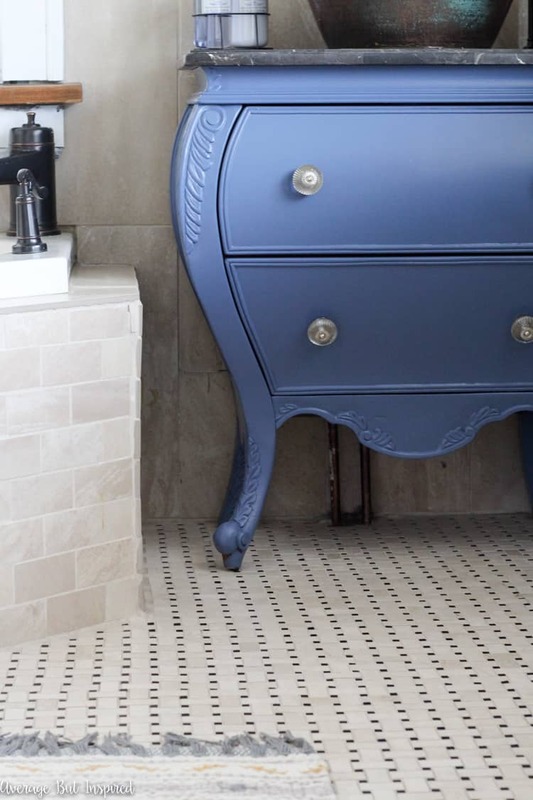 This blue and gold rug is one of my favorite purchases for the bathroom. 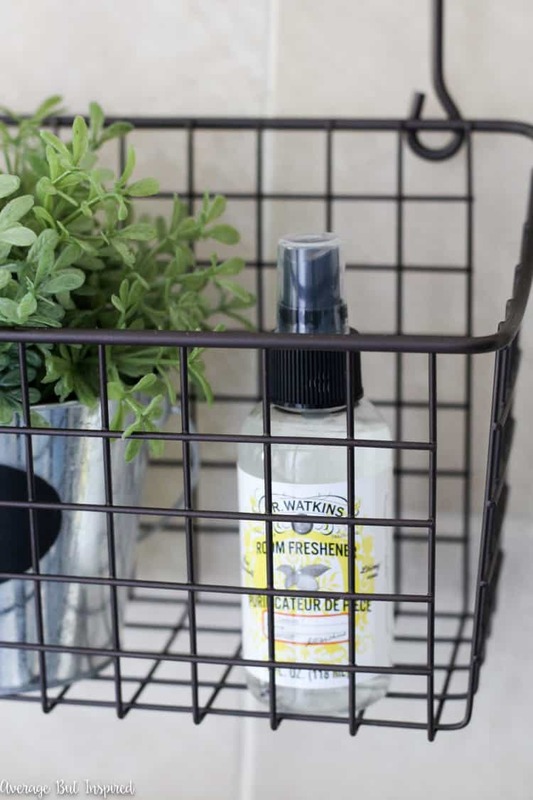 It is super soft (perfect for stepping out of the shower! 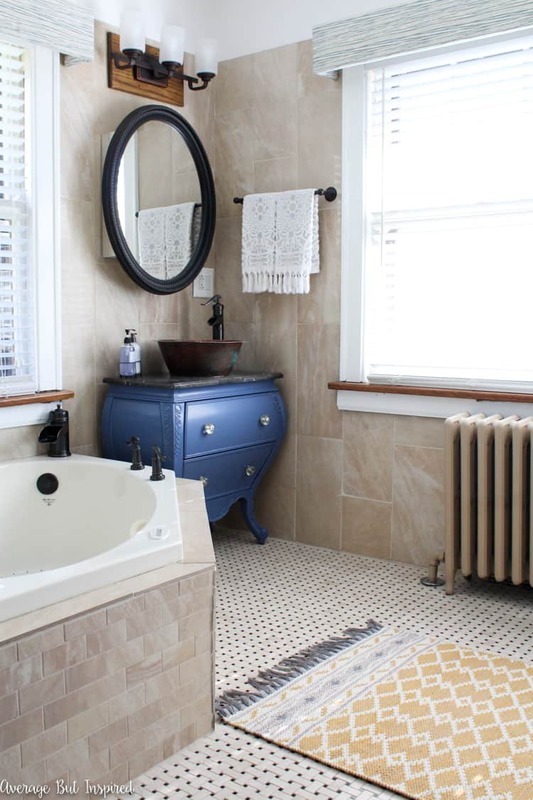 ), and I love that it’s not a traditional bath mat. After bringing home seven rugs to try in the space, I am happy I found the perfect one for in here! 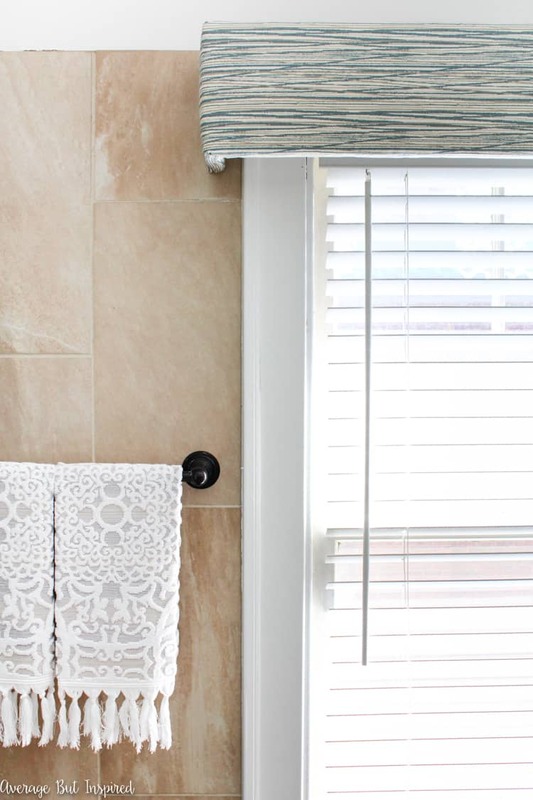 The opposite side of the bathroom got a bold new look, too! At the very last minute (less than 12 hours before I planned to photograph this space and call it quits), I decided to build some over the toilet storage. With some 1×2 lumber, stain, and pretty hanging baskets, I put this ladder storage unit together in less than an hour. I’m glad I did it – my toilet is a top flush so you can’t really put things on top of it. Problem solved! And can I just tell you how much I love having this giant painting covering the illegal utility panel now? With flecks of metallic gold in it, it’s absolutely beautiful! Obviously my master bathroom is far from perfect. All of its flaws – like the terrible tile work, giant windows in a space where you’d like some privacy, and lack of counter space – remain. BUT it makes me so happy that it is now clean and bright and prettier than it ever has been! 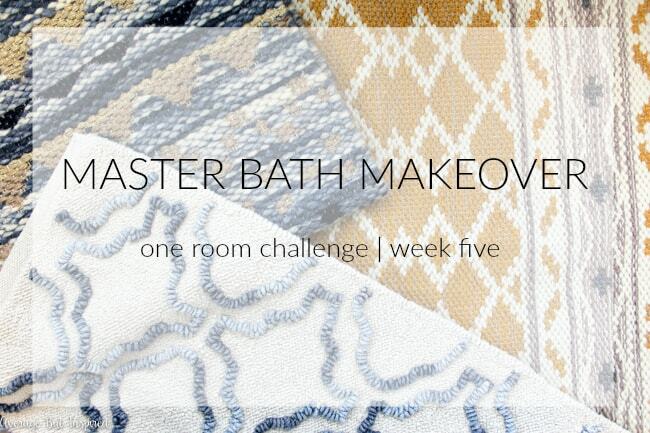 This One Room Challenge was definitely a challenge, but it was so worth it to me! I couldn’t be happier to have an updated master bathroom that doesn’t make me cringe when I walk into it anymore. I also couldn’t be happier to be done with it. It’s time for a break! 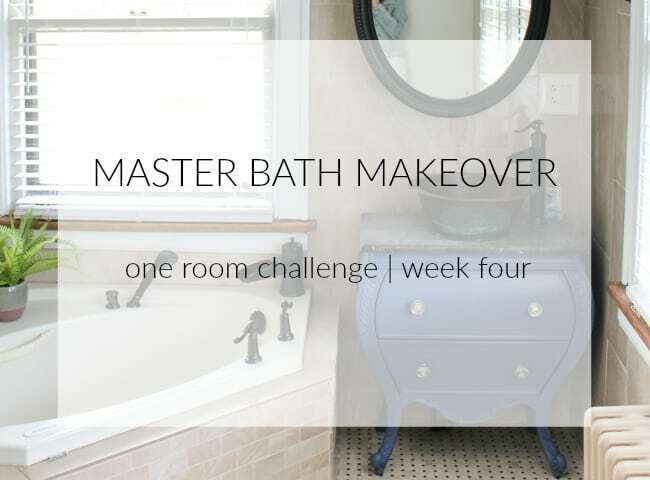 I’m going to put up my feet, watch some Real Housewives, and visit lots of the other One Room Challenge participants’ posts to see their final reveals, too! Thank you so much for taking time out of your day to see how this project turned out. 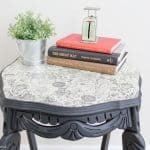 I hope you feel inspired to freshen up a space in your own home! 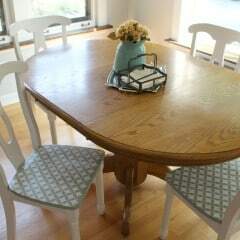 Isn’t it amazing how much impact paint, fabric, and some new accessories can have? If you enjoyed seeing my work, would you be so kind as to pin this post to share the love? 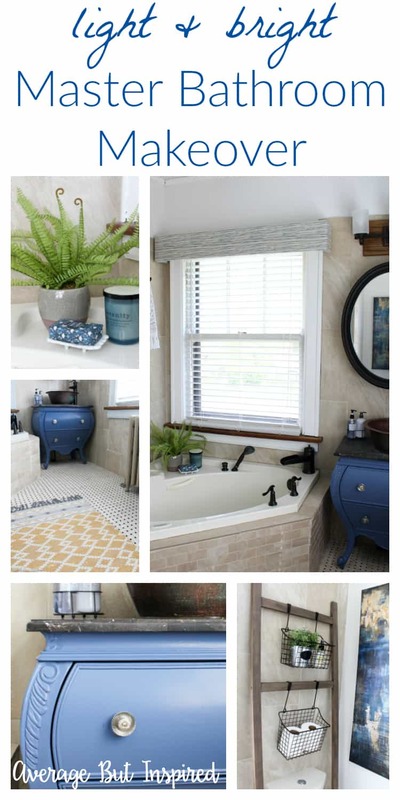 Click any of these images to learn more about the products I used in my master bathroom makeover! 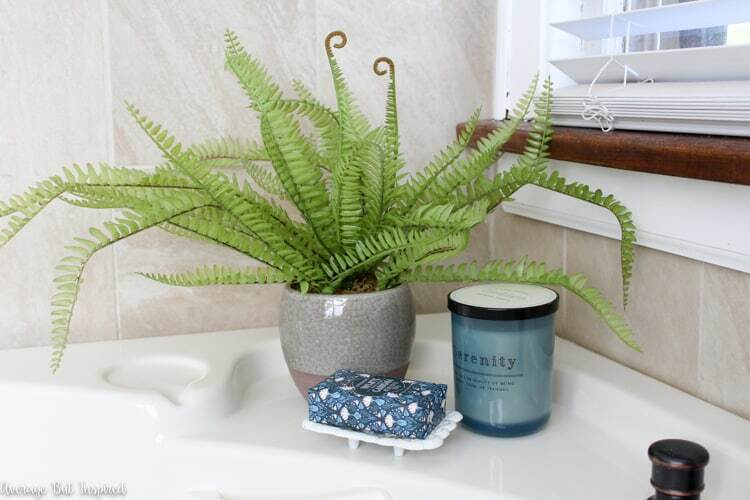 Thank you to these sponsors for providing product for my Master Bathroom Makeover! It looks so great, Bre! The paint alone made such a huge impact and made the space feel so much brighter and larger. I’m loving the blue touches too. And those hand towels are so pretty. Great job! Such a huge difference! I love that you were able to make such a big impact while having to keep some of the main elements. 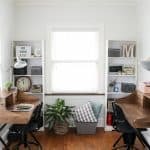 You totally worked with what you had and made it such a pretty space!! It’s perfect Bre! It looks SO much lighter and that vanity was made to be blue! LOVE it!!! Bre! 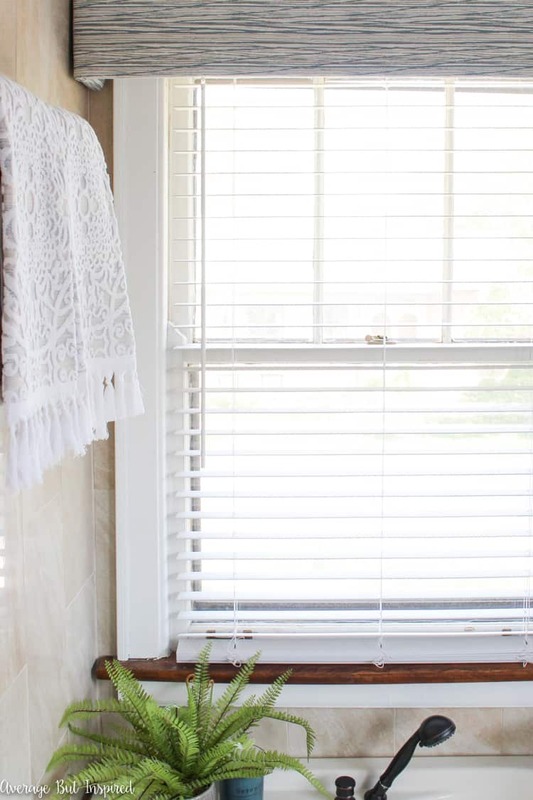 I love the window cornice with the fabric. Such a glam touch! 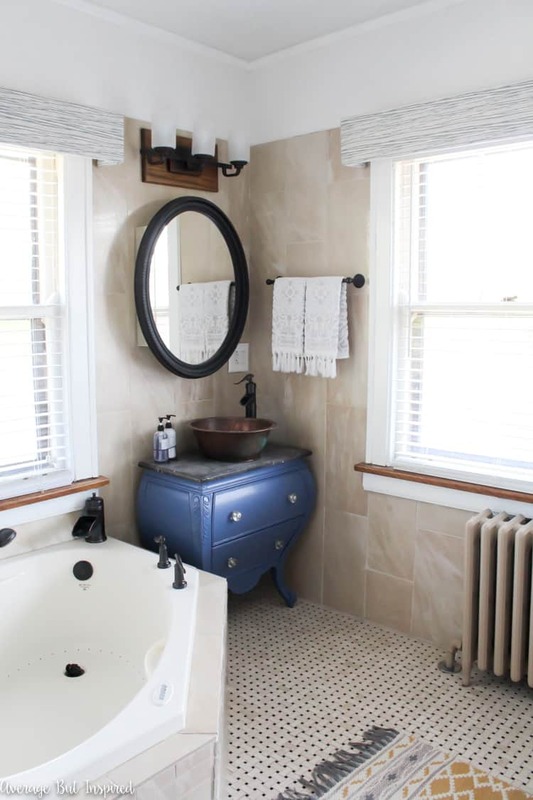 The blue on the vanity is just perfect (you know I love blue hehe) … and those towels are deluxe! Perfect for a spa bath with some vino!! Beautiful job Bre! 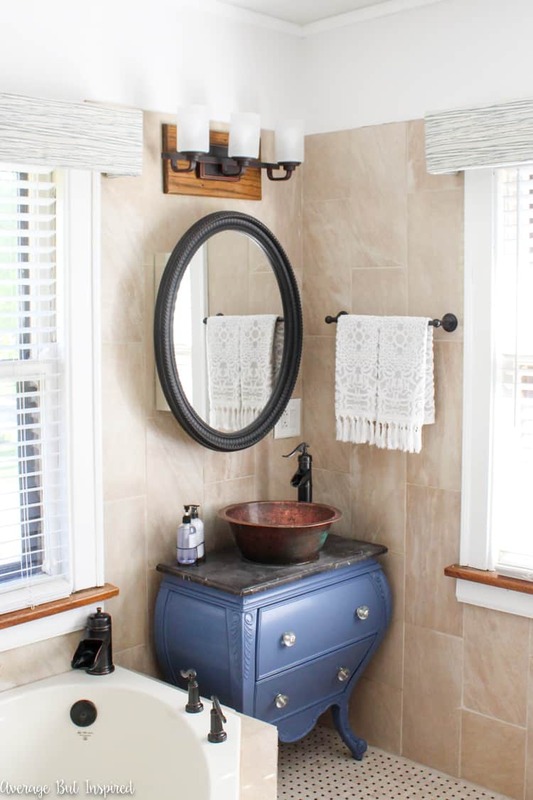 I LOVE that vanity and you know I love that farmhouse ladder! Fantastic job, Bre! You really brightened up the space for sure! It looks so welcoming. Love the doggie too 🙂 Congrats on the ORC! Just beautiful! 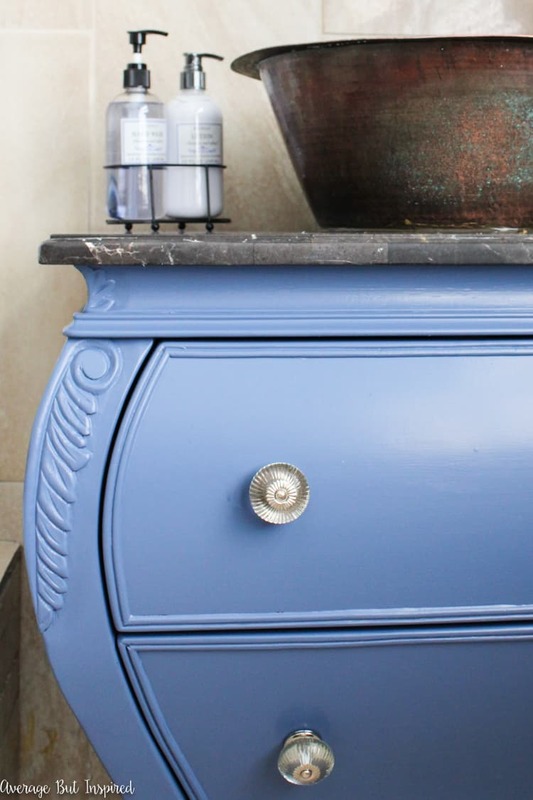 I love the blue painted painted vanity, it looks amazing! It turned out great, Bre! 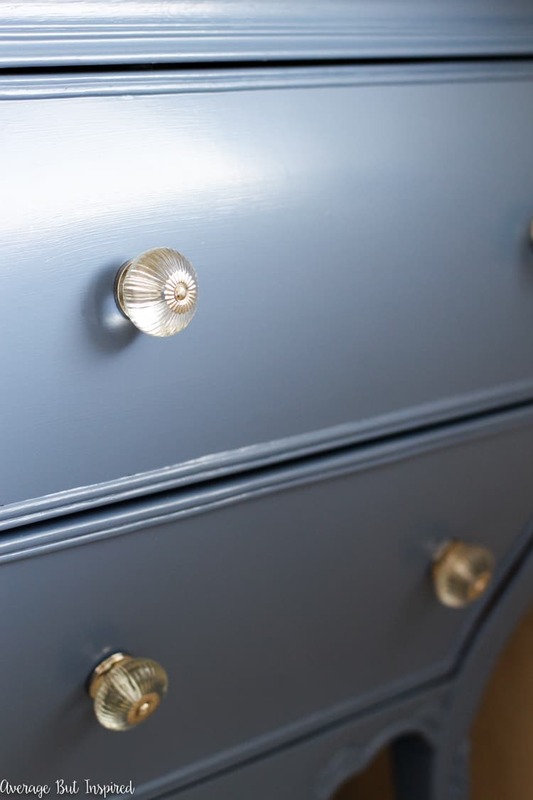 I really do love that blue vanity now, and the hardware is so pretty. Your sink looks fabulous! 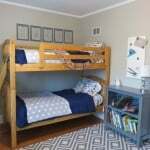 Great job on this room! It looks amazing, Bre! It’s really inspiring to see how much you were able to improve the space without doing a total gut job. Bre I love the fresh look. 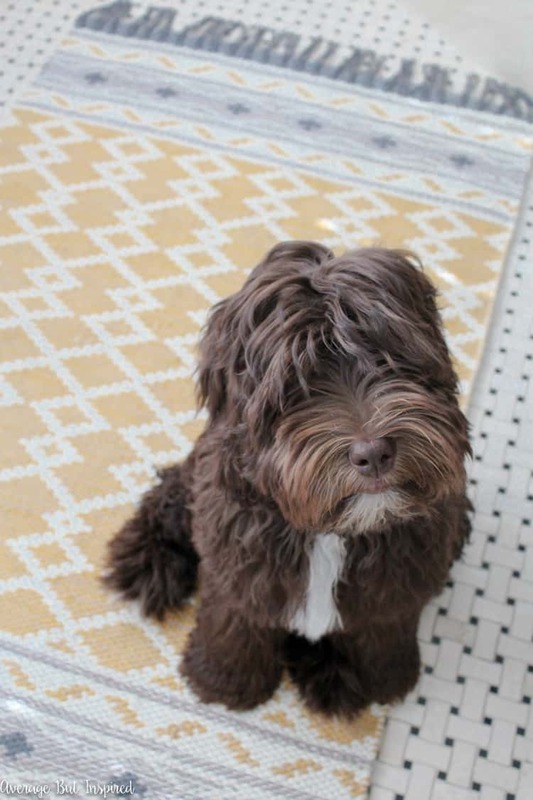 I love that you took the time to find the perfect rug. That makes all the difference. Cute doggy too! It looks so good!! 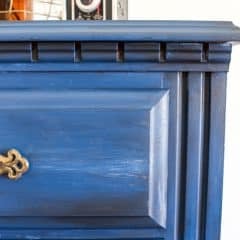 I’m always amazed by what a difference just painting trim makes! 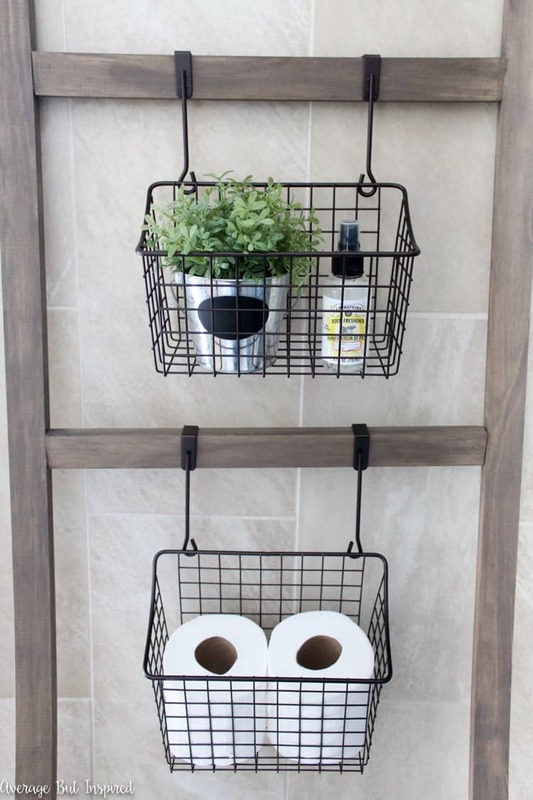 And I love your last minute toilet storage! Good work! You’ve done a really good job. I especially like the painting; not many people would think of adding a painting to a bathroom. It looks amazing, Bre! What a difference! 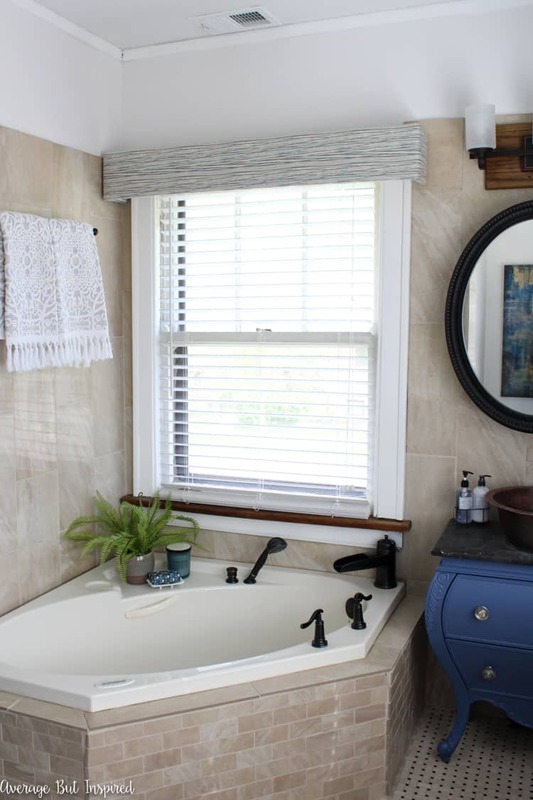 The paint on the vanity and trim really brightened up the room, and I just love the rug you chose. Beautiful job! Can you give dimensions and stain colour for the over the toilet storage? Looks awesome! 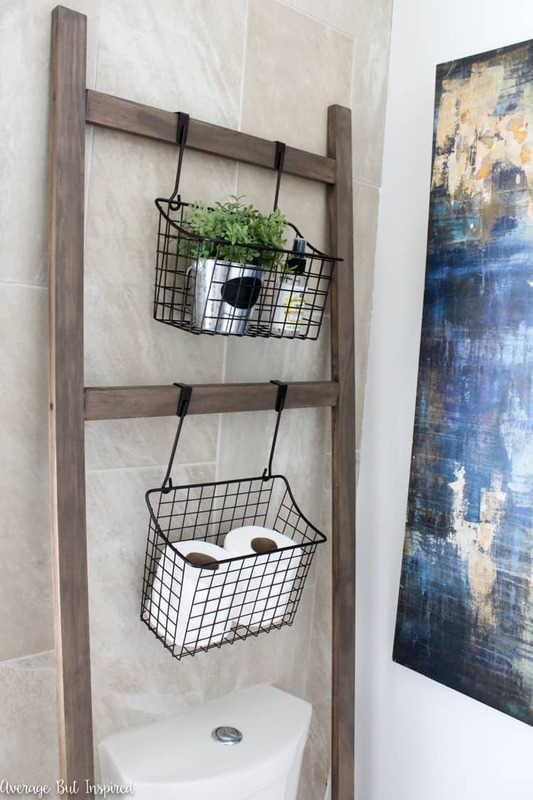 Where did you find the baskets for over the toilet? Love all three of the dogs pictured, especially the brown one. Had to chuckle. 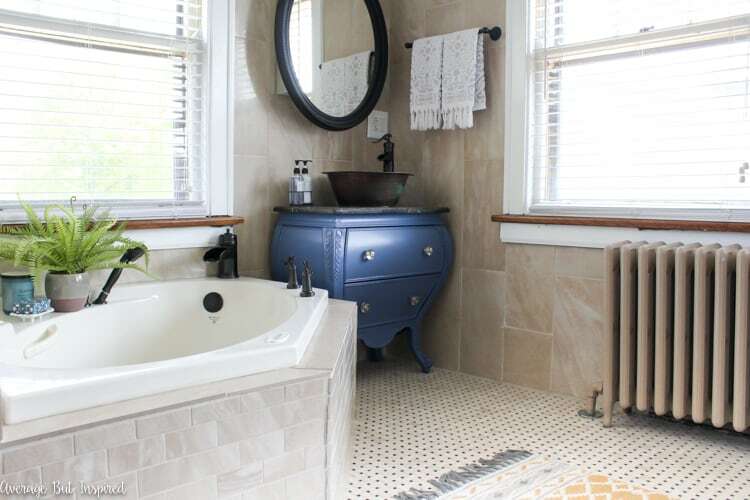 What a change in your master bathroom. Great job. Beautiful job! Can I ask what kind of dog that is??? I want one! That was a fantastic idea to use the copper sink with a homemade lemon mix and salt. Awesome, the panels were looking really smart!!! I know this is a dated post, but I was wondering what color stain you used on the storage ladder. Thank you.